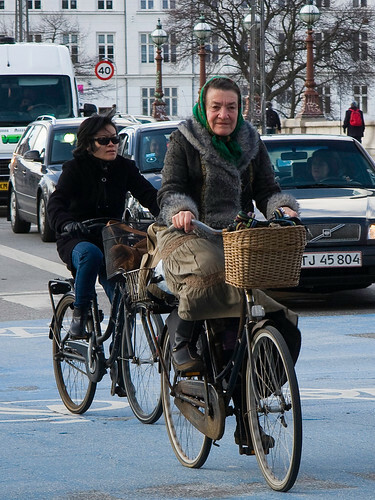 Imagine if you could calculate how my kilometres this lovely Copenhagener has chalked up on two wheels throughout her life. The number would boggle the mind. Brilliant. And what a lovely outfit. How come no one wears helmets in Copenhagen? In the US most bikers wear them. Because helmets are simply no more necessary for riding bikes than they are for walking across a road. The physics of accidents are the same and the proffered reasons for wearing them on bikes are as valid for pedestrians; put the other way round, the ridiculousness of requiring or wearing pedestrian helmets applies with the same logic to requiring or wearing cycling helmets. Unfortunately, in the US and other heavily car-centric societies, cycling is seen as something suspect, that must be somehow "dangerous". But the facts just don't bear that out nor do they support cycling helmet ideology. Despite heavy insistence on helmets, going as far as mandatory helmet laws, places like the US and Australia are among the most dangerous for cycling because they don't address the real causes of danger to cyclists (and pedestrians). On the other hand, the Netherlands and Denmark do address the real causes of danger (and the other side of the coin, safety) for cyclists and provide widespread special infrastructure that encourages large-scale utility cycling. And these two countries are at the top for cycling safety, yet have some of the lowest rates of cycling helmet use around. Safety doesn't come from wearing a cycling helmet. And wearing one to protect your head "just in case" means you should also wear a walking helmet "just in case" while crossing a road or walking near traffic. Lest we forget the all-important Motorist Helmets which have actually been invented, as you can read here. An Australian government resarch study showed that if all car occupants wore helmets the country could reduce the number of deaths and serious injuries in CAR accidents by 25%. Oh, and here's some more on Walking Helmets. How delightfully condescending. Yes, in America, there are more cars on the road, so helmets are a good idea. However, there are other reasons. Many people in America do not ride city bikes, they ride mountain or road bikes, which are meant for sport and are less stable and go much faster. For this reason, Tour de France riders wear helmets. Lastly, Copenhagen is flat as a board, but many cities and suburban areas in the U.S are not. Even if we had the same bike infrastructure as Denmark in San Francisco, I would wear a helmet. Tour de France riders wear them because they have to. They protested when the 'law' came into effect. We have cars in Europe, by the way. We have urban sprawl. The difference is that in Europe we focus on public health through cycling instead of scaring people away from cycling by reinforcing the myth that cycling is dangerous. As Kiwetin wrote, remember your helmet whilst walking, where your risk of head injury is higher. The cyclist unions in a wealth of European countries fight against helmet promotion and legislation because there is no conclusive scientific proof that they work. The 'flat' terrain myth has be debunked ages ago. There are dozens of cities around the world with high levels of cycling that are hilly. I was in San Francisco last year and saw so many cyclists not wearing helmets. And the hills there are overrated. I rode around on a one speed with three friends on european style bikes without any real problem. Making up excuses for not cycling or for how dangerous cycling is doesn't sell cycling to the mainstream. If you want to wear a helmet and that keeps you on a bike, great. If someone doesn't wish to wear one (50% of American cyclists according to the stats) and that keeps them on a bike, great. Unfortunately, the latter group are subject to playground bullying by the former all too often. seems like the comments have been derailed by the "helmet, no helmet" banter. back to the original photo, how classy and elegent! a truely lovely sight to see aged grace. Mikael, you lost this when you started America-bashing in the first place. Why don't you just keep it to nice looking people on bicycles? How does one 'lose' a scientific discussion? And calling it 'America bashing' is dreadfully childish. You should get to know us and this blog better before sticking out your tongue like that. oh, so talking about walking helmets and motorist helmets is not childish? you remind me of the car manufacturers; back when governments started to introduce mandatory airbags and seatbelts, they howled, thinking it was going to make people think driving was unsafe! now they can't seem to put in enough safety features. if you operate a vehicle in a roadway, there are inherent risks, no matter what you do. if people decide to mitigate them by wearing helmets, you should applaud them, instead of mock them or their countries. Some of the contributions to this blog strike me as a tad idiosyncratic. Let there be no doubt Danish authorities are trying their best to persuade cyclists to wear helmets. There is very little conclusive scientific evidence to back up your claims. Motoring helmets have been invented and I invite you acquire one. Comparisons with seatbelts doesn't hold water, as seatbelts have a great deal of scientific evidence to support their use. The helmet promotion in Denmark has resulted in a fall in the number of cyclists. More on that over on Copenhagenize.com. It seems my question has spurred quite the discussion. In fact it was in response to the original photo. I love the look of people not wearing helmets, I ride a beautiful bike and try to look as stylish as possible when I ride, my helmet does not. I still choose to wear it whenever I ride, here in Louisville, KY there is no helmet law so I choose to do it for myself. Love this blog by the way, it has inspired me to be even more chic when I cycle, I even wore a skirt today! Thanks! I Think the lady here is Elisabeth, the flammenco instructor. She used to have a dance-studio on Islands Brygge, and a dog named Django. In looking at this lovely elderly woman pedaling along, I noticed the poor condition of her bike. Is there some sort of program in Copenhagen or other European cycle-centered cities for seniors to get their bikes serviced for a nominal fee, or even free? Hers looks to be in need of some routine care. Is this a part of cycling that Europeans don't worry about? I doubt there is any such thing here in the U.S., but it would be nice if there were. hi you, I would like to exchange links with your site.